Have you ever been in a situation where you know you want to find a JPEG file type and you know the name of the file, but you don’t want to search other document types on the Mac? 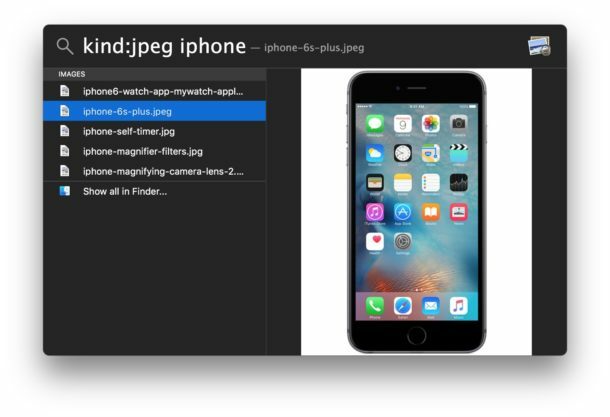 You can use image specific file format search operators on Spotlight in Mac OS to help narrow down these type of searches, in this case we are limiting to JPG files. With this ‘kind’ operator of ‘jpeg’ (note JPEG is the file type, despite often having a file extension of .jpg the file type is always JPEG), only documents which are JPEG files will be searched and returned to match. We’ve discussed similar tricks before where you can specify just about any kind of document, from pdf, to doc, txt, etc, learn more about file type format search with Spotlight here. And if you’re interested in learning more about search operators in Mac OS in general, we have a whole post on search operators within Spotlight if you’re curious. These tricks apply to all versions of Spotlight in every macOS version which has supported the wonderful search engine, whether it’s contained within the Spotlight menu or the newer versions with the floating Spotlight window instead. Try it out yourself, it’s very useful. You are searching for the type (jpeg) not the the extension (jpg). How do you get Spotlight to return only files with a certain filename? For instance, I used the “kind:jpeg” followed by “katie” as the filename, but I got lots of jpeg files that didn’t include “katie” in the filename. try “kind:jpeg name:katie” that should do it. Personally I miss when we could customize how Spotlight in Mac OS returns results again, the new versions don’t allow that and dumb stuff from the web, YouTUbe, and Wikipedia which is just annoying. I want to search my files, not the web. Old versions of Spotlight were better for files.